It’s a day to beg for candy, not to bring your Pinterest board to life. Yesterday, someone shared this on my Facebook feed, citing it as “fun” way for kids to share Halloween candy with their friends. It made a vein in my forehead pulse so hard, I thought I was going to have an aneurysm. 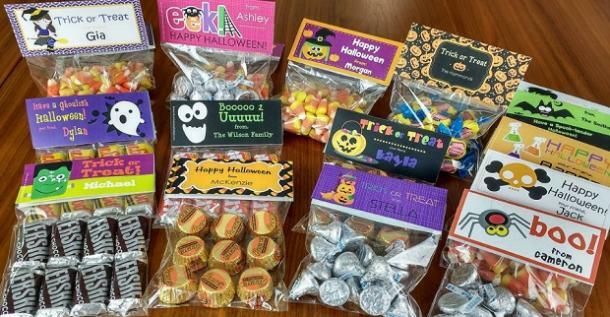 CUSTOM-PRINTED, PERSONALIZED HALLOWEEN GOODIE BAGS FOR NEIGHBORHOOD CHILDREN. Um, no. No, no, no, no, no. We can NOT let this happen to Halloween. Pinterest parents have already RUINED birthdays. It started with goodie bags and just got worse from there. “Happy Birthday” banners are now required to be etched on strips of birch bark, each centerpiece takes a minimum of 40 man-hours of assembly, and every guest now gets to take home a mason jar full of artisanal, small-batch Play-Doh or a vinyl record released on the week they were born. We couldn’t just be OK with cake and ice cream and the occasional piñata. We had to let parental one-upmanship and our own frustrated artistic dreams escalate the birthday decoration arms race into something unsustainable and obscene. And now that perversion is leaking into Halloween and we need to cauterize this wound before it spreads any further. Why would anyone, ANYONE, in their right mind need to hire a printing company to make custom labels and store-quality candy bags just to give some fun-sized Snickers to the kids in their second-grade class? Remember when we used to trick-r-treat with mismatched pillow cases rather than monogrammed, knitted candy satchels from LL Bean or Restoration Hardware? What’s wrong with a pillow case? It just holds CANDY. Everything around the candy is WORTHLESS. The only reason we tolerate the WRAPPER is because it prevents the candy from sticking to other pieces of candy. (Health concerns also play a lesser part.) Why in heaven would anyone EVER say “Hey, I need more wrapping around this candy. And it needs to be custom, 4-color print on-demand”? Here’s what you need for a classroom Halloween party — a big plastic bowl. If you want to get fancy, a stainless steel salad bowl will work too. Fill the bowl in question with fun-sized candy, turn on “Thriller” and “The Monster Mash,” and you’re done. The kids will entertain themselves and NO ONE should EVER care if you hang-up last year’s cobwebs. The reason I care is because Halloween is one of the most creative days of the year. It’s a holiday that celebrates kids building the perfect homemade Transformers costume out of cardboard boxes or a mom spending weeks turning her garage into a haunted house with black plastic sheeting and some peeled grapes. THAT is creativity well spent. Custom goodie bags is just bored, bourgeois garbage. It’s hollow and wasteful. It’s wrapping something that everyone wants in something that nobody wants. Those bags literally involve employing a manufacturer to create something that will literally be acknowledged for two seconds and then destroyed and thrown away. If there were people indigenous to that giant island of plastic garbage in the Pacific Ocean and you handed them one of those goodie bags, they would mutter “Disgusting,” throw it into a recycling bin, and go back to living under their homemade ziggurat of discarded hazelnut Keurig cups. That’s how offensive they are. Personalized Halloween goodie bags are not creative. They’re a cry for help. So, parents, please, can we direct our Halloween creativity to more appropriate channels? Make your kid (or yourself, even) a cool costume, dress up your porch, knit a spider outfit for your dog. And, if you want to put a bag of special candy aside for a family friend, throw it into a freakin’ Ziploc and write on it with a Sharpie. Let’s not turn Halloween into a magic pixie dream holiday for graphic designer parents only, OK? Halloween is for EVERYONE and they don’t need personalized bags to know it.